We love leggings. That’s an absolute fact. And we don’t just wear leggings for yoga anymore. The comfort and movement afforded by a great pair of leggings means we live in them every day. Why not! And there’s a company that can help you enjoy new leggings every month through their legging subscription service. Enjoy Leggings lets you enjoy a new pair of hand-picked leggings every month. 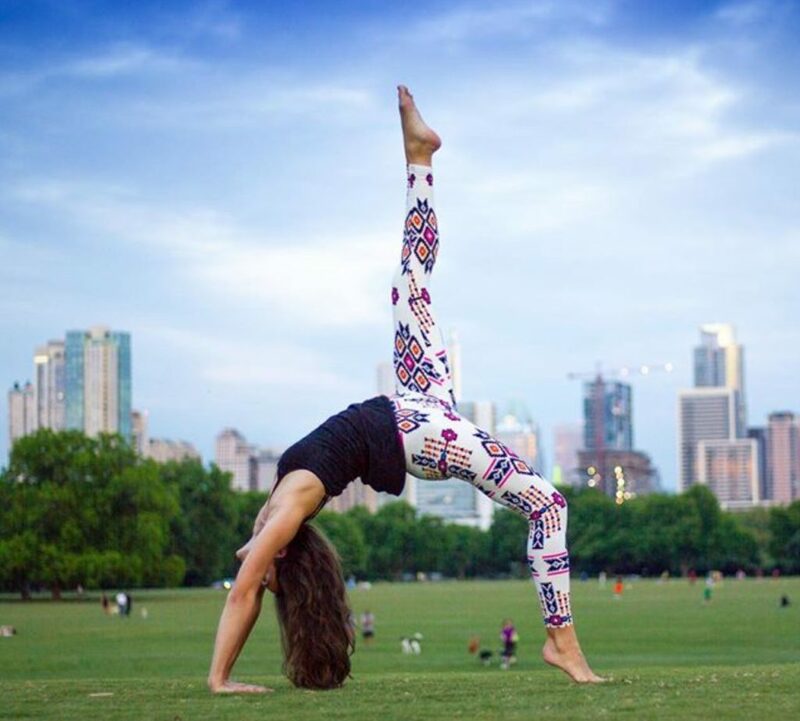 Based in Austin, Texas, the company with a very funky name ships you a new pair of comfy leggings every month for just $16.00. You can sign up on a month to month basis or purchase a leggings subscription for a full year. And they did hold up to our testing. 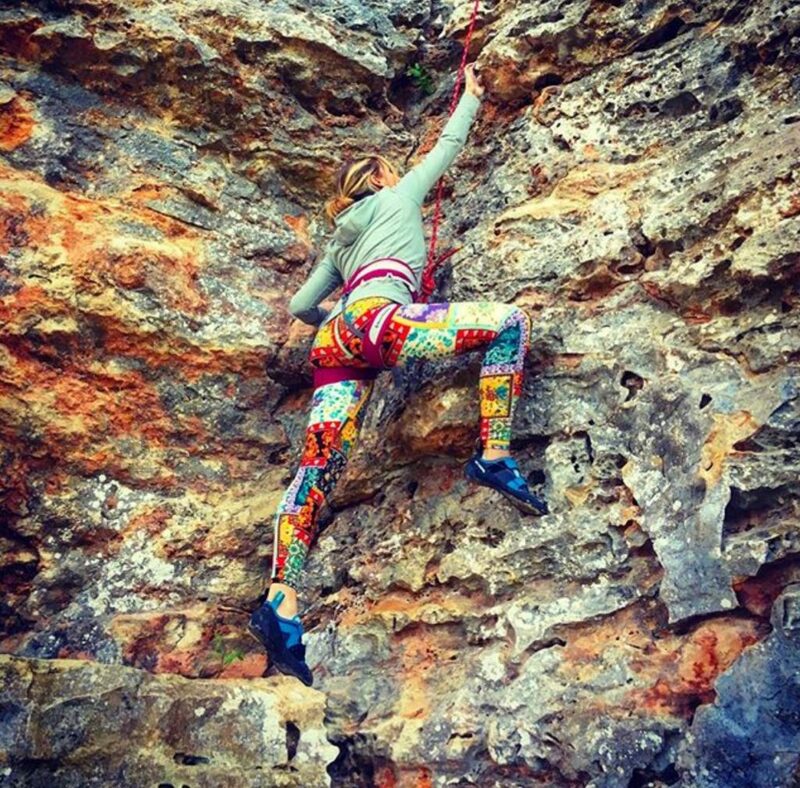 Running, hiking, climbing, and all our yoga asanas were met with comfort and durability, no issues. And okay, yes there was a lot of slouching and couch surfing done in them too. The colorful designs and comfortable elasticized high waist band means you are dressed and ready to go at a moment’s notice. And they have not skimped on the length. Enjoy leggings are a full length legging, that don’t ride up or suddenly turn into waders. These easy, on-the-go leggings are a poly/spandex blend that feel super soft to the touch and are light as a breath of fresh air, allowing you to breeze through your day. Whether you’re running off to yoga, the gym, or heading out to pick up the kids from school, imagine getting a fresh new pair of leggings to love every month. Simple, easy and affordable, so you can enjoy your leggings every day! Available in sizes 2 to 18, why not use this link to set up your legging subscription service today. You know we want you to enjoy your leggings every day too, so the gracious owners of Enjoy Leggings are giving 3 lucky readers the chance to win a pair for themselves. Comment below – What’s your favourite activity to do in leggings? Example, mine is to live! Giveaway contest begins at time of publication Jun 21, 2016 and ends Jul 05, 2016 11:50pm EST. Winner(s) will be randomly chosen and notified by email on July 12, 2016. Winner(s) must reply to notification email by July 19, 2016 11:50pm EST. Hike! They are so comfortable, I do most every activity in them. I like to go geocaching in leggings!! My favorite activity to do in leggings is to go bike riding. I love the look and comfort of leggings, and I do almost everything in them. I wear my leggings to my yoga class. I would wear them for running errands and lounging around the house. I love to wear them, because they are so comfy and cute! I like wearing leggings when I do bootcamp workout, yoga or weight lifting. I also like to wear around the house when I am relaxing. That is exactly my favorite thing to do in leggings to , just live. I love leggings . Thank you for giveaway . I like to work out in them! so comfy! I like to wear them at home when I’m working doing yardwork, cleaning. my favorite thing to do in my leggings is EVERYTHING! I love traveling in them. My favorite activity to do in leggings is exercise and lounge on the weekends. When working from home, leggings are my choice for comfort. i like to do my exercises in them and also like to go for walks. When am I not wearing leggings? In bed, that’s about the only time 🙂 When I worked professionally I wore them plenty. Paired with a long tunic, knit sweater or a dressed up shirt I was able to pull it off. Now that I’m retired I still wear them almost daily. They’re so comfy and versatile. One of man’s greatest inventions!! My favorite activity is watching TV. RUN!!! Michigan mornings are chilly and leggings give just enough warmth! Since I don’t have any right now it would be either walking, biking, hiking, or zumba or maybe all the above. I actually just bought my first pair of leggings only a few months ago, and now there isn’t a thing I don’t do in them lol. I love how you can dress them up or down with a change in top and shoes. All I wear anymore is leggings! I love to lounge and shop in them especially! I wear leggings when doing housework, so comfy. I also wear them when walking, working out (free weights), or just hanging out. I like to say that I wear leggings to workout but I wear them to class almost everyday because they are for comfortable! I like to stretch in leggings! My favourite activity to do in leggings is hiking! I do everything in my leggings! I love to explore in leggings! Walking, trekking, running – anything is possible! Leggings are my all day every day choice! My favorite thing to do in leggings is everything. I love wearing leggings and being comfortable. Entering for my wife. She does everything around the house in leggings. She says it’s about comfort! I like to work out in them. I would do yoga in the leggings! I do love leggings closest to the skin when I layer my clothing for judging outdoor winter sports. My favorite activity to do in leggings is go for walks in my neighborhood! I like to wear leggings so I can eat whatever I want without restrictions! I live in leggings! I wear them all the time. I go for walks in my leggings. I like leggings for working out. I do anything and everything in leggings. Whether it’s sitting watching TV, or running to the store, I am in my leggings! I SERIOUSLY LIVE IN MY LEGGINGS! IT IS THE FIRST THING I GRAB IN THE MORNING AND THE LAST THING I TAKE OFF AT NIGHT! LOL. I like lounging around the house in leggings. I love leggings for everyday life, especially yoga and if they are thick enough I use them for paddle boarding!!! I would wear them around the house and taking care of the kids! Take them to the zoo, I’d wear them anywhere! I love leggings! 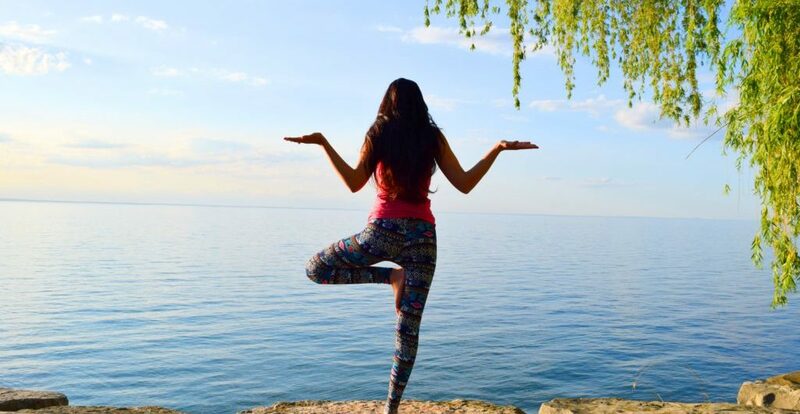 My favourite activity in leggings is yoga! Love to do yoga or just lounge! I love hiking or doing yoga in leggings. They’re so comfortable. I love camping in my leggings! I wear my leggings to the gym! So comfy! I like using it with all my daily activities, so comfortable. Go to the casino! Just kidding. Walk with my daughter! I like to workout in leggings. It’s nothing I can’t do in my leggings. They are very versatile. My favorite thing to do in leggings is go out for a walk! Leggings are so comfortable, I can do just about anything in them. I love to run errands in leggings, hiking, walking with the kids, pretty much anything because there is always a chance to do yoga ??? They’re very comfortable to work in. My favorite activity to do in leggings is live my life because they make my life comfortable and stylish. I love hiking in my leggings, not only are they super comfy, but they are cool and keeps me from feeling overheated on long hikes! I like to work out at the gym in leggings. I like to study in leggings. I shared the post via Pinterest (clarebear148) and Twitter (@jdcaldwe11). Great contest! I enjoy wearing them any time, especially during my morning walks. I wear leggings when I need to have a stress-free day at home and I want something super comfy to wear. I like to go for a walk, or using my elliptical in leggings. My favorite thing to do in leggings is to take my puppy for walks after dinner! I love to walk the dogs in leggings. As a mom I cannot think of something I would do WITHOUT leggings!! I wear them all day every day, they are the best for chasing around a toddler! Taking a nice walk and running errands! I like wearing my leggings while hiking. I like wearing them all the time they are comfy especially while doing zumba or just dance. I like do errands after yoga classes, but I would probably wear them all the time!! I would like the leggings for walking and cycling. I like you love to live in them, they can be dressed up, slept in, or to do my daily yoga or tai chi in. Love leggings. I pretty much live in leggings…which seems to be a popular opinion! But if I really had to narrow it down I would say my favourite thing to do is plan my next trip in leggings! I love going for long walks in my leggings. i like to binge watch tv shows in my leggings! I like to do household chores or run errands outside in leggings. I enjoy leggings for yoga & also for snuggling up on the couch for a movie night or netflix binge session! Thanks for the chance! I do allot of driving and flying and I never realized how much more comfortable wearing leggings are. If I could I would wear only leggings every single day. My favorite thing to do in leggings is travel. I love wearing leggings to work! It feels like I’m wearing PJ’s, but looks polished with boots and a tunic. I love to live in leggings, walk around in leggings, exercise in leggings, and just play in/outdoors with my kids in leggings. They are like a second skin. I love them! My favorite thing to do in leggings is EVERYTHING lol. I wear them almost every single day. Thank you for the chance. Walking and running, they are very comfortable. I like to sleep in leggings. Love all the different designs and colours. I love to live in my leggings on a daily basis! My favourite thing to do in leggings is lounge – so I must lounge all day!! LOL Leggings are life. This is such a generous giveaway – thank you! I love taking my daughter on walks in leggings! i like to lounge and sleep in leggings. liked and shared on facebook! LEGGINGS ARE MOST COMFORTABLE ON WALKS. I love to relax at home in leggings and a long top.